Reviewing Authority's Recommendations: Although the dates of the incident alleged in spec 1 differed between the 2 affidavits and witness, accused was responsible for this action which was in punishment for having two handfuls of beans in the victim's possession. Accused beat, slapped and put POWs in the guardhouse on no rations and/or reduced rations for minor infractions of the rules (being unable to work, failure to bow, spitting in the accused's presence, gambling, disobedience of orders). The accused made POWs work longer because he decided they were working too slowly in 14 degrees below weather; he required sick and physically unfit POWs to go to work; Accused ordered guards to beat the POWs for little or no reason. 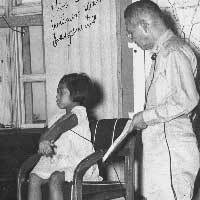 Reviewing Authority: The camp commandant stated that the practice of not giving food to POWs in the guardhouse was a Japanese Army Regulation handed down in Feb. 1945. He went against this command and stated that only for the first day would POWs in the guardhouse get no food. Thereafter, they would get a restricted diet. The working hours and conditions were contracted between the government and the company and the accused had no control over it. Accused, furthermore, had no control over who was put on sick call; it was the duty of the Japanese and Allied medical officer. When the commandant was not present in the camp, accused stated that he confined POWs in the guardhouse, not as punishment but for detention pending the commandant's return and decision. Accused denied that he ever hit a POW and denied ever ordering guards to hit POWs and denied ever witnessing a PW being hit. There was no complaints received about beatings despite the multiple channels available to POWs to directly report to the camp commandant. the logical presumption, from all the evidence, is that the victim himself best knows the date on which he was beaten, which evidence, if accepted, establishes the commission of the offense as alleged." The evidence given was sufficient to sustain the findings of guilty. There is no evidence that accused was not sane at the time the alleged acts were committed and at the time of trial.